lav007usNo Comment on How To Get Rid Of Pigeons? Pigeons can become a nuisance. They get up in your rafters, nest in your bushes & air conditioners, and relieve themselves all over your property. At some point in time, you may find yourself in a situation where you simply need to get rid of them. One of the main issues with pigeons is that they leave their feces throughout the area they inhabit. If the situation is not taken care of quickly, it can easily get out of control. Before taking any drastic measures, (such as killing) it is very important to contact local authorities to be sure you are not breaking any laws. Pigeons can breed frequently; depending on weather conditions and food supply. This is why it’s extremely important to keep your property as clean as possible. Waste receptacles should be covered at all times, in order to diminish the birds’ food supply. Removing standing water from your property is also very important because pigeons swarm towards areas with plenty of water. Pigeons eat just about anything and will migrate to areas with the most food and best living conditions. If you are experiencing car and house damage from pigeon waste; these are a few great ways to get them to move along. I would recommend attempting to get rid of pigeons in natural ways before resorting to killing, poisoning or shooting. These simple options are much easier, don’t leave all the mess, and avoid hassle of possibly breaking local laws. 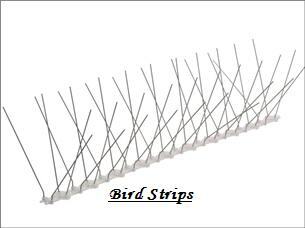 Bird strips are spikes that can be placed on various popular bird perching sites. They prevent birds from wanting to perch; keeping the area cleaner and more livable. There are various types of scarecrows available. Many of us picture the ones portrayed on television or in our favorite movies, but there are also ceramic versions; many that look like owls. This will not only keep pigeons away but many other types of birds. Birds love to nest in high-up, safe environments. If you can get rid of these areas, you will also get rid of pigeons. Traps are one of the most popular ways to get rid of pigeons, because they don’t hurt the birds and they are very easy to set up and use. All you have to do is place the trap in an area the birds typically feed. Add some feed inside the trap and you are ready to go. You’ll be surprised how quickly you start catching them. Sometimes the easy way just doesn’t cut it and the pigeons still aren’t budging. When this happens, there are still a few things you can do. Depending on how you want to handle the situation, you could resort to poisoning or shooting the pigeons. If nothing listed above has solved the problem, the best thing for you to do is call pest control. They will know exactly what to do and you won’t have all the hassle of doing it yourself. It may not be cheap, but is extremely effective. Previous Post Do you find it hard to make money online? Next Post Is Affiliate Marketing Profitable?